We are huge Harry Potter fans! This was myself, baby daughter and husband last year. 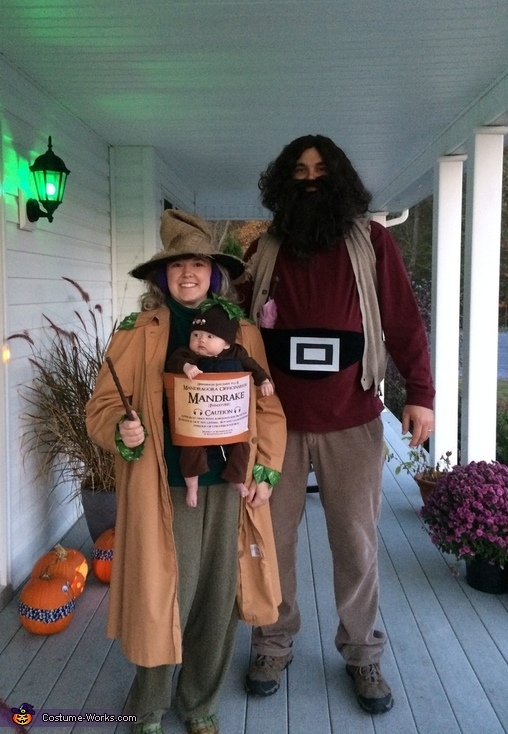 Baby Mandrake in the baby carrier, Professor Sprout and Hagrid!! I made these costumes. Mostly things from the Goodwill repurposed. Trench coat with fake plants glued on. Witch hat with burlap glued on. I made the earmuffs and the wands with dowel rod,glue and paint. I tattered my husband's clothes, made the belt from an old plaque and I made the umbrella from scratch!! Most proud of that. Pink felt, glue, paint, dowel rod. The only thing we paid full price was the planter bucket (cut it in half to fit around my daughter and my husband's hair/beard. I worked SO hard on these costumes. I was postpartum, she was horribly fussy and with terrible colic, when I look back at these she looks so cute and precious, so worth it (heart eye emoji lol). Happy halloween!